Etta, Peter and Jonah all find themselves at a cabin by the shore of Yellow Lake, and flung together in the terrifying series of events that follows. Jonah has come to Yellow Lake to try to get in touch with his Ojibwe roots. Peter is there to bury a lock of his mother’s hair – her final request. Etta is on the run from her mother’s creepy boyfriend, Kyle, and his dodgy friends. But as the three take shelter in the cabin, finding surprising solace in each other’s company, they soon realise that they have inadvertently stumbled onto the scene of a horrifying crime, and Kyle and his cronies have no intention of letting them escape. 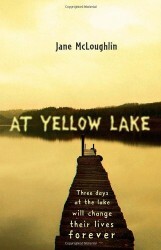 A sparkling debut from new teen author, Jane McLoughlin, At Yellow Lake will keep readers gripped until the final page. A page turning story which oozes menace. A fantastic debut and a treat for Young Adult readers. This is a great book! … It’s very much the kind of book where you read ‘just five more pages’ before you do whatever you were going to do. And another five. Maybe ten. A jolly good and thought-provoking read … with well drawn characters and plenty of action.